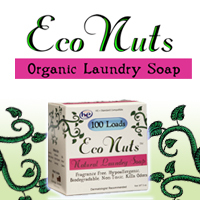 Earth Faerie Momma: I Want To Try Eco Nuts! Eco Nuts sound amazing! I would love to try them. I have heard some great things from other moms and even ABC news takes a closer look. Check out this news clip. So they are organic, natural, safe, easy to use, get your clothes clean and they save you money....?!?! Have you tried them? Share your story below!